The purpose of Drop Test is to determine a bottles ability to withstand free-fall impact forces. 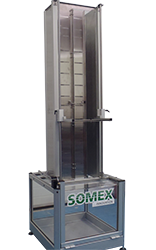 This device allows the user to drop test a bottle of any size on the Horizontal or the Vertical in accordance with the ISBT standards. The bottle is placed on a height adjustable gate which is released manually and dropped onto a steel plate. There is a splashguard and collection tray with drain off to contain any product. unique design Drop Test using vacuum to hold the container providing flexibility of drop angle. Adjustable drop height with easy release of the specimen onto the impact plate. Height adjust by chain drive (hand operated). Horizontal, Vertical & Angular drop position (up to 45 Deg). Drain to capture any spillage.